Last night marked the second season debut of HBO’s True Detective. If last year’s Woody Harrelson and Matthew McConaughey tinged season one led the audience through a metaphysically drenched Louisiana swamp thriller while sparking a McConaissance and nostalgic longing for the work of H.P. Lovecraft and Robert W. Chambers’s “Yellow King”, season two seems to be a call back to the most American of films, the California noir. Judging from episode one pseudo kingpin Frank Seymon (Vince Vaughn), spartan Ventura County detective Ani Bezzerides (Rachael McAdams), damaged highway patrolman Paul Woodrugh (Taylor Kitsch), and corrupt Vinci investigator Ray Velcoro (Colin Ferrel) appear destined to two step through a shadowy square dance of intrigue and murder with high stakes transportation infrastructure investment as the backdrop; modern 21st century SoCal envisioned through an early 20th century genre. Yet, whatever one thought of episode one, “The Western Book of the Dead,” it’s worth looking back at one of the defining noir films of the 20th century and how it too, depicted the America of its day through a prism of darkness and doubt and for better and worse, revealed some of the nation’s darker impulses and biases. “Hold tight to that cheap cigar of yours Keyes. 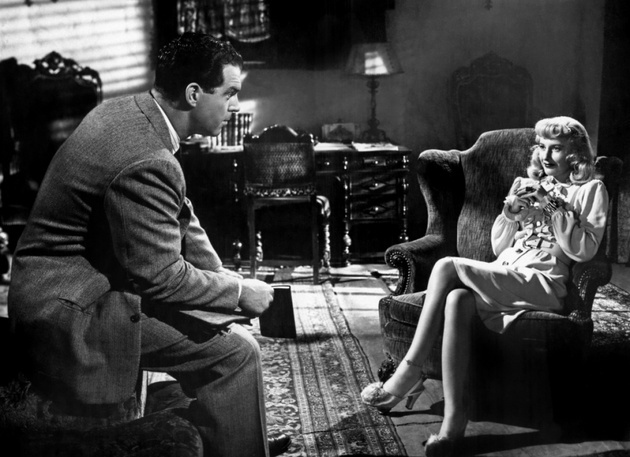 I killed Dietrichson, me, Walter Neff, insurance salesman, 35 years old, unmarried, no visible scars, until recently that is.” Fred MacMurray’s mortally wounded protagonist of “Double Indemnity” confesses to his supervisor Barton Keyes’ (Edward G. Robinson) via dictaphone. A suburban insurance salesman seduced by a married seductress, Neff represented one man’s “descent into moral blackness” as he lies, cheats, and murders to reach an illusionary objective. Indeed, MacMurray’s portrayal of the rakish Pacific All Risk insurance ace in Billy Wilder’s 1944 noir classic remains a precedent-setting standard of excellence in the genre and, more specifically, of the Los Angeles variety. Three years after Double Indemnity’s release, Leimert Park residents witnessed the gruesome and still unsolved Black Dahlia murder, symbolizing the very fears Avila pointed out. 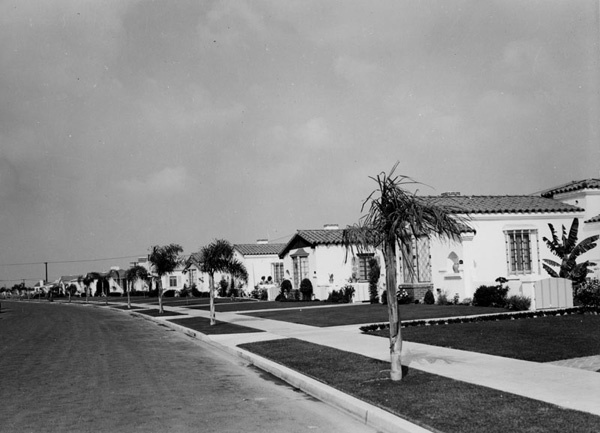 Though at the time a white, middle and working class, enclave, Leimert Park had begun to attract black homeowners, contravening spatialized racial boundaries. The pretty, fame seeking victim, Elizabeth Short served as a real life symbol of the perils of interracial mixing, the collapse of gender roles, and the dark corners of the noir metropolis. Taken with the movies of German émigré Billy Wilder, the aforementioned “Double Indemnity” and the Black Dahlia murder underscore white America’s discomfort with an increasingly diverse City of Angels, and noir’s role in securing this preconception. The Heart of European Darkness in L.A.
Wilder’s impressions of America, based in great part on his time in Los Angeles, represent a wider opinion held by European émigrés of the period. Though many did not necessarily buy into what Mike Davis calls noir’s “anti-myth” regarding L.A. — a reference to the genre’s rejection of mythmaking by the city’s overzealous boosters — many nonetheless came to resent the metropolis, and viewed it with an unrelenting pessimism. “Here was the ultimate city of capital, lustrous and superficial, negating every classical value of European urbanity,” Davis noted in his seminal “City of Quartz.” “Driven by one epochal defeat of the Enlightenment to the shores of Santa Monica Bay, the most unhappy of the exiles thought they discerned a second defeat in Los Angeles as the ‘shape of things to come’, a mirror of capitalism’s future.” 3 Noir, Davis argues, made L.A. the city intellectuals loved to hate, yet perversely for European intellects, notably those hailing from France and Britain, this only deepened the fascination. Due in part to this symbolic play of their social and racial transgressions, Wilder bathes the two characters in darkness, a technique that emerged as a metaphor for metaphysical blackness. 7 Moreover, Dietrichson and Neff do not limit their boundary crossings to image and metaphor alone; rather Neff depends on two non-white characters to pull off the murder of Phyliss’ husband. First, Charlie, a black janitor at Neff’s apartment complex, provides an alibi for the felonious insurance salesman on the night of the murder, while later that evening Neff depends on a timely phone call from Westwood Jewish lawyer Lou Schwartz — a name that is derived from the Yiddish word for “black.” Moreover, when the plan falls apart, Neff opts for literal border crossing as he attempts to abscond to Mexico. That the two couch their playful sexual innuendo in the guise of a police officer and a careless driver only adds to the sense of impropriety and deviancy. The bonds of marriage won’t limit Dietrichson, and Neff never seems to acknowledge the institution at all, as his intentions appear transparently clear from their first encounter, only growing in lecherousness in later scenes, such as the uncomfortable attention he pays to Dietrich’s anklet bracelet. If one doubts the conflation of blackness and white deviancy, consider that in its 1943 Fundamentals of Real Estate Practice, the National Association of Real Estate Boards suggested that agents be on the look out for individuals living on the edges of respectable society. The bootlegger, the madam, the gangster, and the “colored man of means,” as the pamphlet pointed out, all served as sources of “neighborhood blight.” 8FHA housing studies and mortgage loans, both of which marginalized heterogenous communities, or even those with a handful of minorities, provided the economic and political structure to protect against the kind of residents NAREB leaders believed sparked community decline. The unsupervised, sly, and cunning women of noir traversed these boundaries, and were often punished for their transgressions in the end. Ultimately, Dietrich dies at the hands of Neff, but only after taking her own considerable shot at the insurance salesman. 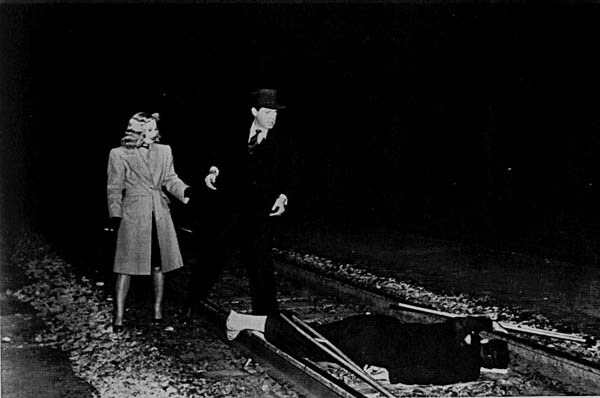 Neff stumbles away from his second murder fatally wounded. Having migrated from Boston, Short might not have been the stereotypical Midwestern arrival, but her protestant middle class background aligned neatly with the city’s demographic image. Not that the gruesome killing needed much embellishment; Short’s assailant had bisected her body and carved a Jokeresque smile into the sides of her mouth. Los Angeles media saturated the public consciousness with lurid stories about the case. Despite the fact the city witnessed only 70 to 80 murders a year, with five newspapers and the blare of the radio, the media promoted an image of Los Angeles that reinforced those of early film noir. Described in various accounts as imaginative, flighty, given to prevarication, and possibly a habitual liar, the unsupervised Hollywood hopeful symbolized the dangers of the postwar city and its corrupting influence. To be fair, these kinds of fears originated decades earlier as the nation’s industrialization in the late 19th century spurred increasing immigration from abroad and internal migration to cities. With the rise of Hollywood in the 1920s and 1930s, along with the various industries that expanded in the same period, Los Angeles emerged as an entrepot for young women intent on living the California dream, away from the watchful eyes of patriarchal families. Last seen at the Biltmore Hotel on January 9, 1947, Short’s body was discovered by Leimert Park residents six days later on January 15. Many observers wondered where she had been, and with whom, over those fateful five days, but no answer came. Instead, police absorbed false confessions and leads, gumming up efforts to solve the case. 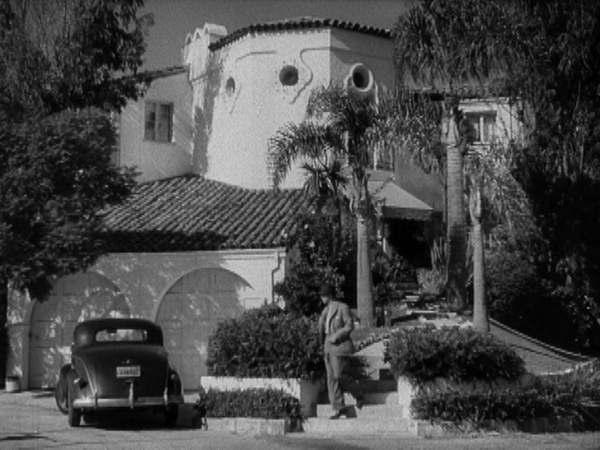 Architecturally and aesthetically, the community aligned neatly with the kind of trends visible in “Double Indemnity.” Leimert Park’s Spanish Colonial homes, though more modest than the Deitrichson house, furthered the neighborhood’s noir connection, while appealing to white America’s faux European sensibilities, or at least their conscious/unconscious sublimation of the city’s Mexican history. Leimert Park’s transformation resulted directly from housing pressures brought to bear by this demographic change. The Black Dahilia murder unfolded within this context and noir framing. “I killed for money, a woman,” Neff confesses in his last moments. “I didn’t get the money, I didn’t get the woman.” The lurid promises of the noir lifestyle never came to fruition, as evidenced by the fates of Phyllis and Walter. For the Black Dahlia, she found fame, but only in her demise, which of course confirmed the kind of race and gender based assumptions that undergirded L.A. noir. The genre channeled the fears of post war America, worried about damaged white male masculinity, directly threatened by those wayward women and minorities of the postwar city. “How was I to know murder sometimes smells like honeysuckle,” Walter Neff laments. Likewise, how were we to know cultural alienation, sexism and racism lay at the heart of noir and the soul of postwar L.A.? 1 Eric Avila, Popular Culture in the Age of White Flight: Fear and Fantasy in Suburban Los Angeles, (Los Angeles: University of Berkeley Press, 2004), pg 80. 2 Billy Wilder, interview with Robert Porfirio in Film Noir Reader 3: Interview with Filmmakers of the Classic Noir Period, Eds. Robert Porfirio, Alain Silver, and James Ursini, (New York: Limelight Editions, 2002) pg. 101. 3 Mike Davis, City of Quartz: Excavating the Future in Los Angeles, (New York: Verso, 1990), pg. 21. 9 Josh Sides, L.A City Limits: African American Los Angeles from the Great Depression to the Present, (Los Angeles: University of California Press, 2003) pg. 102. 10 Mike Davis, City of Quartz, pg. 30. A version of this article originally appeared under the Intersections column at KCET Departures in September 2013. Interesting read, but there’s a mistake right in the beginning: “The King in Yellow” is by Robert W. Chambers. Absolutely correct, thanks for the heads up. Cultura, assim como ler um bom livro. Muito bom mesmo! Reblogged this on Syd Williams.